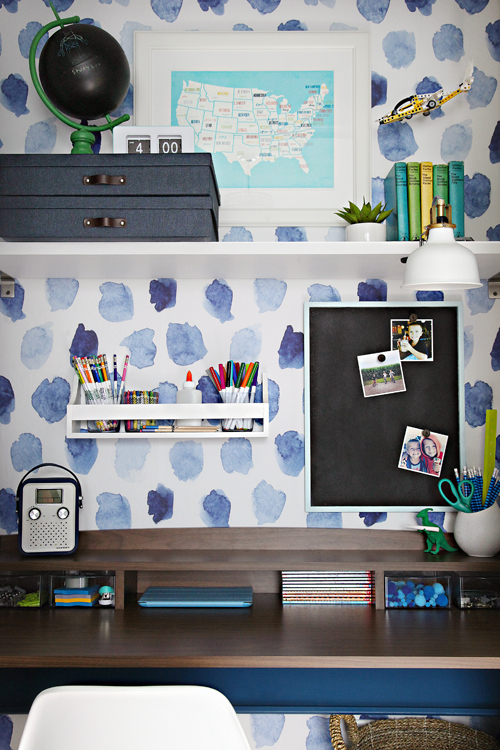 IHeart Organizing: Back to School: A Creative Workspace for our Boy! 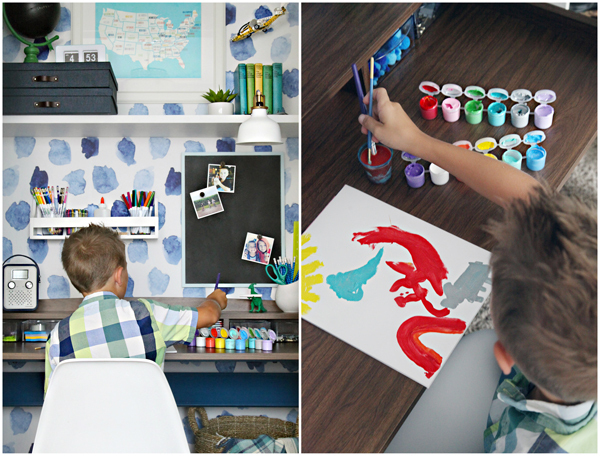 26 Back to School: A Creative Workspace for our Boy! 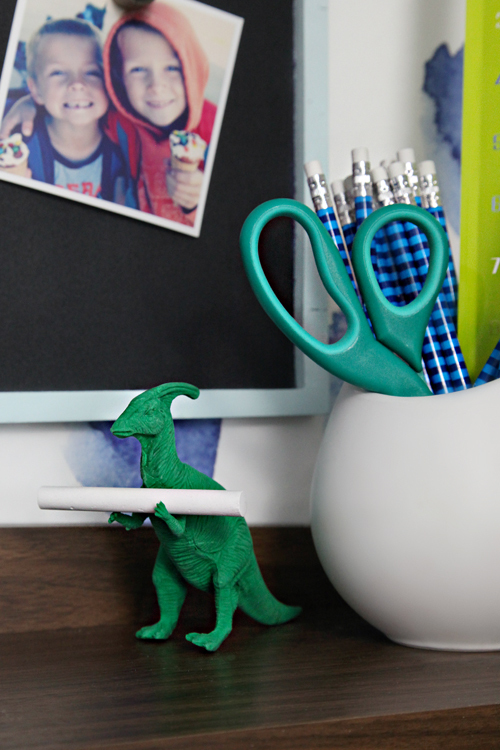 Typing back-to-school is a little surreal, however, it is just around the corner. I have heard that some folks have even begun sending their kids back already?! Slow down summer time! 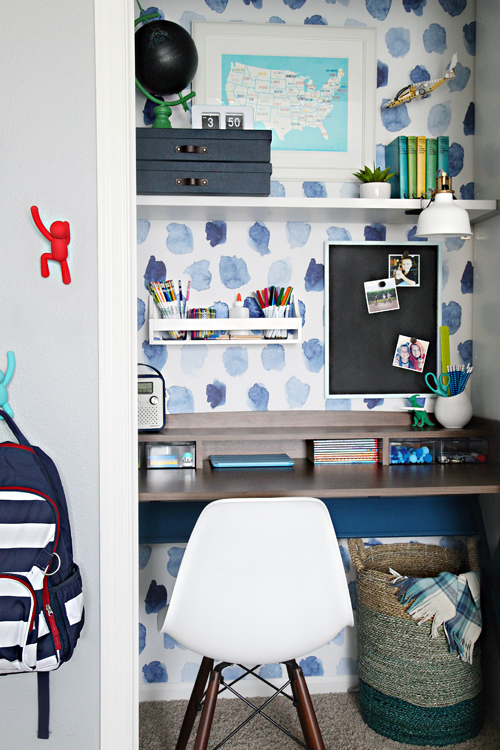 With that, I was recently challenged by Wayfair to create a fun kids “workspace” to coincide with back-to-school time. Challenge accepted! The timing couldn't have been more ideal, as we were in the brainstorming phase of moving our youngest son to his own room. 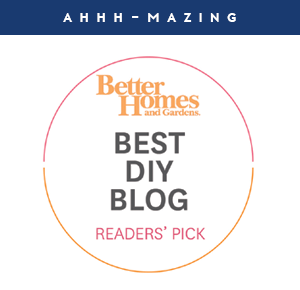 When Wayfair contacted me with the opportunity to hook him up with a place to study, we high-fived and started hashing out some really exciting plans. The only problem I had was keeping Parker reigned in, Wayfair has an endless selection of home decor and organizational items. Just look at the excitement in his eyes! Parker is taking over the guest room, and although he will miss sharing a room with his big brother, he is pretty giddy about getting a space to call his own. This kid is so fantastically energetic... and he loves drama, arts & crafts, science, creating and building. He had about a trillion ideas for his new space, so we have been slowly whittling through all of them to come up with something pretty cool and playful for our fun little man. With this challenge, it was really important for me to not only create something that is functional, but something that matches Parker's personality. His new workspace is just that! Our guest room has two closets that connect on the inside. One side was previously used as a decorative desk space, the other as a hanging space. This has been a really nice setup to offer to our guests, and the previous wallpaper was crushed on and adored by many (including myself each and every day for the last six years). Parker requested that his desk remain in the closet just like his older brother's, and all of his clothing will be stored in the second closet just to the right. It made it easier to move on when I saw the new paper up and smiling back at me. 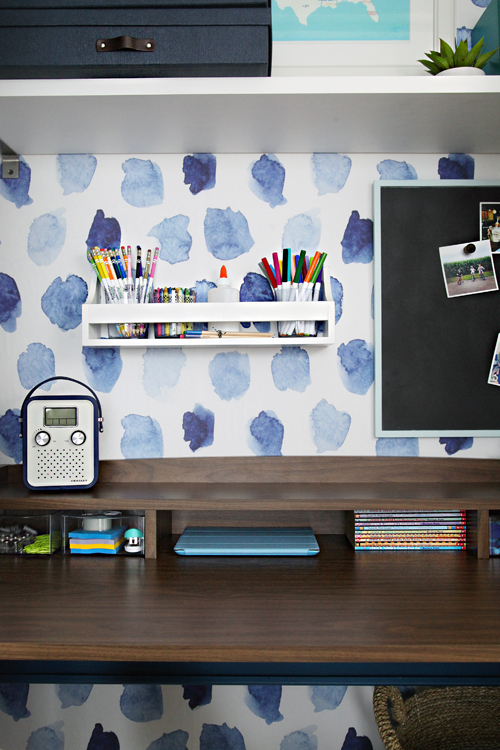 I mean seriously, the watercolor pattern we picked out is absolutely "spot on" for our creative boy. Isn't it incredible? Application was super quick and easy, and the image of the closet on the right was the last our son had seen before heading to bed. Bryan and I worked around the clock getting the rest all setup to reveal it to him the following day. As darling as the entire space is, there was a lot of thinking about how to make it as functional as possible. My ultimate goal is always to give my boys the freedom to be creative. I have art and craft supplies in almost every room in our home, encouraging them to color and paint whenever the mood strikes. Most of the time they work on their projects in the kitchen or in their personal space downstairs, but as they grow they also like to have a bit of privacy. I have also realized that it is becoming more and more important for them to have these quiet personal spaces, as their homework is becoming increasingly difficult and the need for them to be able to stay focused is crucial. 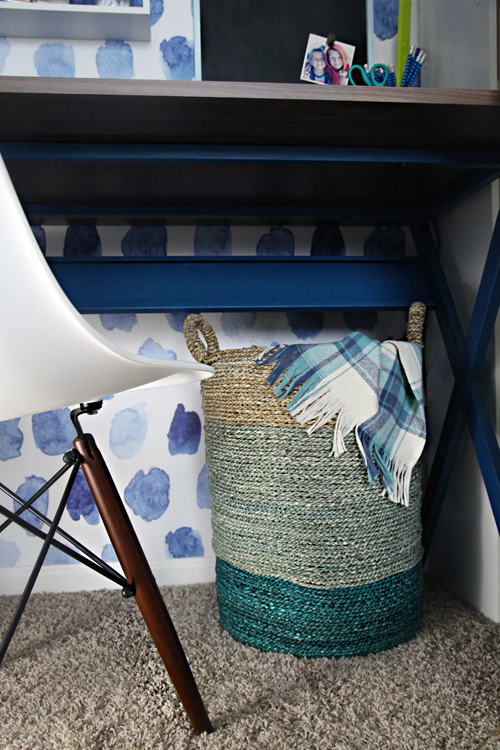 Just like I always paint closets and line drawers, I am a huge fan of amping the wow factor with a little pattern and color. 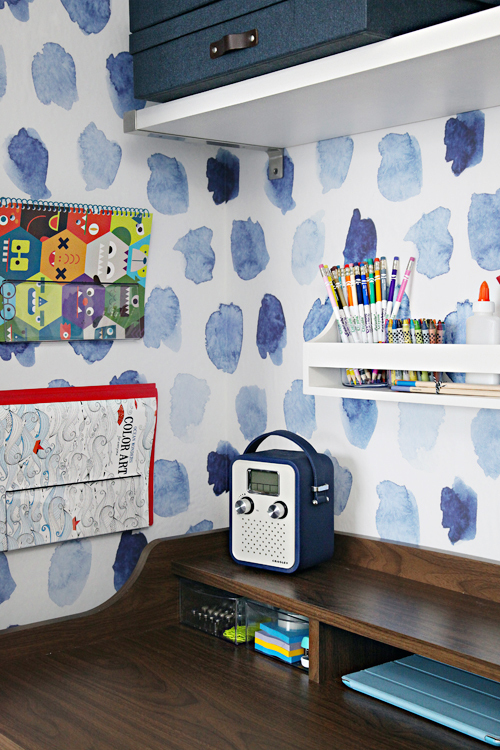 That is no different in a child's workspace so I always try to add a pop of personality in the form of a great wall treatment. 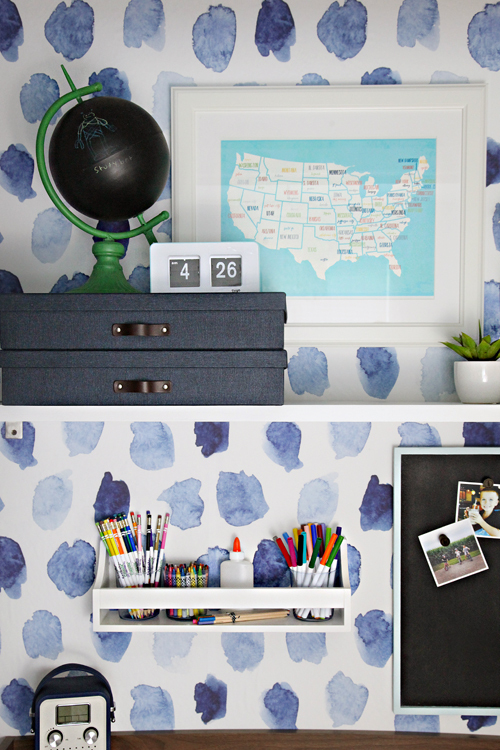 In this specific case, the watercolor dot wallpaper won our hearts over. For our boys, I like to look for something that offers enough room to spread out, is easy to clean and has clean lines. This desk not only fit our closet dimensions, but it also added a little layer of open storage which was a nice bonus. Plus, that wood tone is so nice and warm next to all of the cool accents. I also loved the X shaped legs, which received a coat of blue paint to soften and customize the base. Extra task lighting is always important in any workspace, whether you are a child or an adult. Overhead lighting typically is not enough to allow eyes to focus on a specific desk task, therefore something more direct light should be used while working. We looked at a variety of options for Parker, everything from a desk lamp to puck lights, but ultimately landed on a task lamp we had in our storage room. 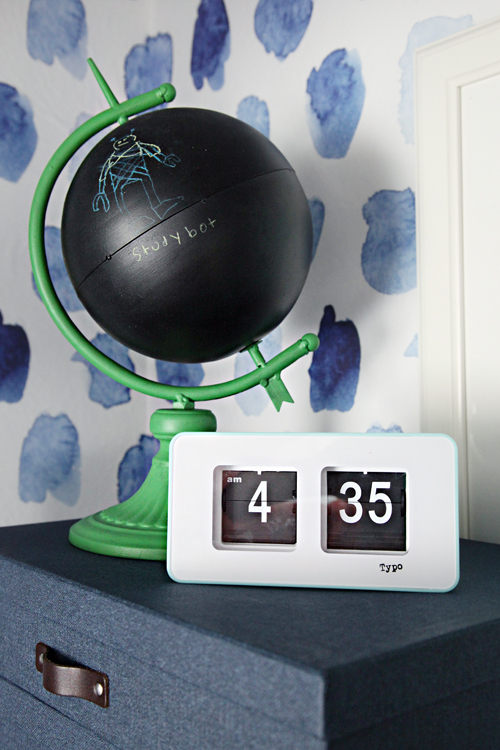 It is extra nifty that it clips directly to a shelf to take up very little surface or wall space. 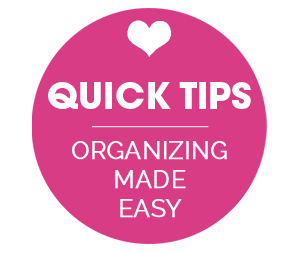 Shelving - A full sized shelf holds bulkier items and a smaller wall shelf works to store a few craft supplies. 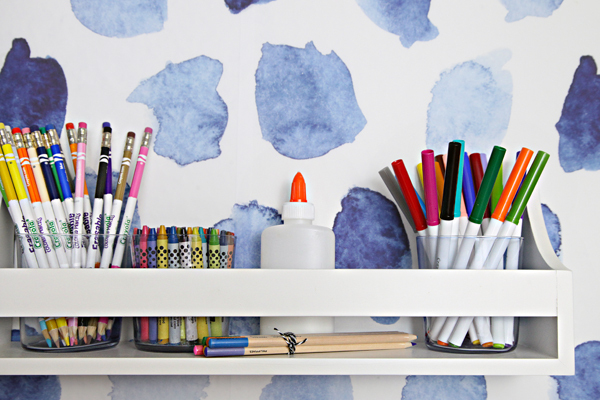 When paired with simple cups, a variety of coloring and writing utensils can hang out in the shelf pocket. 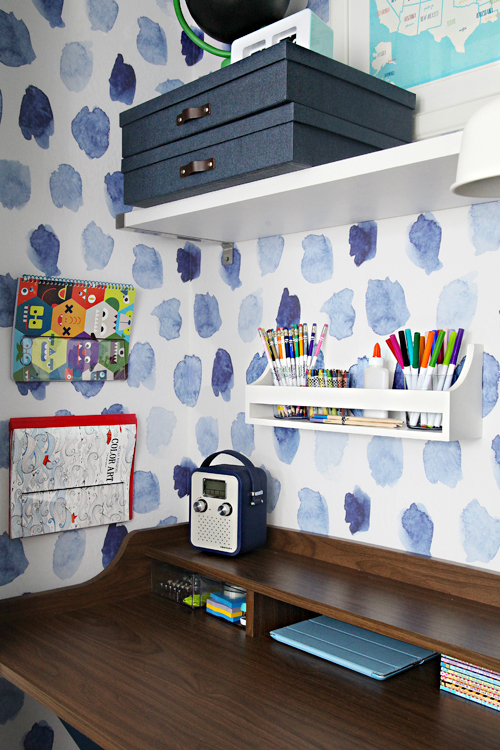 Shelving utilizes the vertical area of the wall, and helps to keep the desk surface clear of clutter. 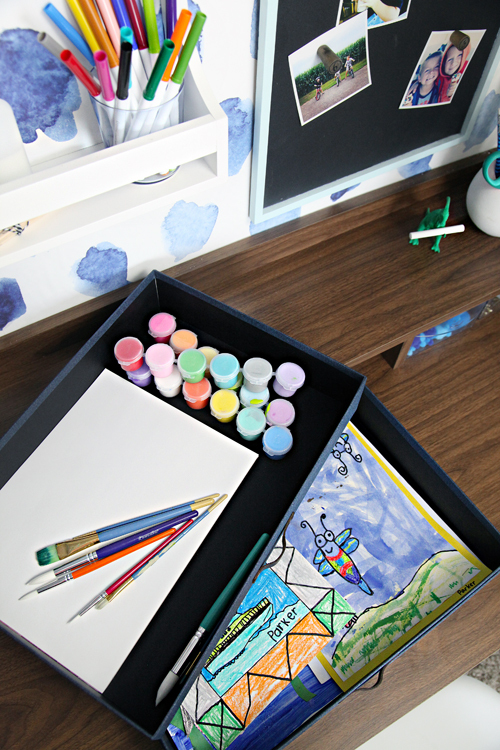 Art Boxes - Our little guy creates quite a few masterpieces so I added an art box for the items that are rotated out from display. A second box holds paint specific items to reduce some of the visual mess. Wall Pockets - I like to use wall pockets to store anything that is grabbed for frequently. While our son works at his desk, he will most likely reach for his folder, coloring book and notebook on a regular basis. These chart holders are actually intended for the Dr's office, but I found them to be an A+ solution for extra papers and notebooks. I love that they are clear while also being slim enough to tuck off to the side of the closet without impeding on the rest of the design. 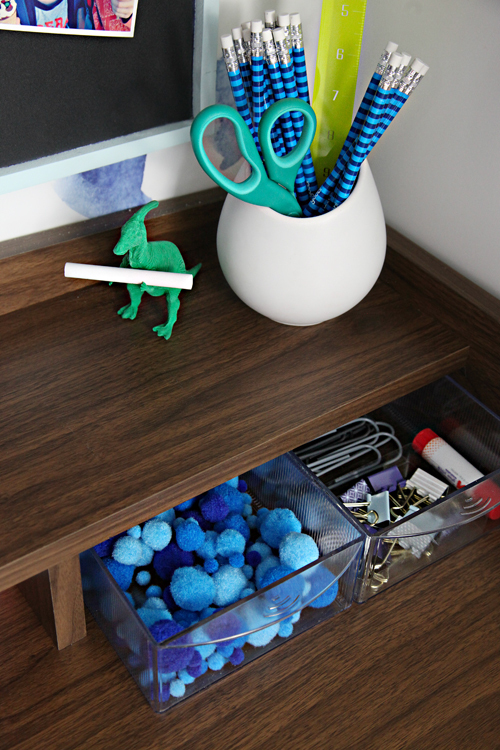 Small Drawers/Organizers - Desks come with a lot of small accessories and crafts and drawer organizers can be really helpful in organizing those itty bits. This specific desk didn't have any drawers, so I added a couple that were part of a plastic stacking set. I always recommend looking into ways to make your furniture pieces work harder for you, don't be afraid to hack other storage items to create a functional pairing. Our boys bring home a lot of worksheets, which is fine, but they can also be a little repetitive and boring. To spice up the homework factor, I like to give the boys a variety of surfaces to write on. In this case, I added two chalk surfaces; one in the form of a globe and another in the form of a magnetic board. I found some great colored chalk pencils so now spelling and math fact practice nights can be a bit more lively. Dry erase surfaces also tend to be a hit in this house. I also added a colorful map for our son to reference and to help him memorize his geography, as well as a chalk holding dinosaur pencil eraser. Doesn't get more playful than that! Storage is certainly very important, but so is making the space feel just as special as the person using it. The magnetic board is a great place to pop up a few photographs and art projects, while a small hanging Lego airplane shows off his most recent building accomplishment. So what did our little big guy think of his new space?! He hasn't stopped chatting about it since we revealed it to him. And he couldn't wait to get to work on his first painting project in his new personal space. 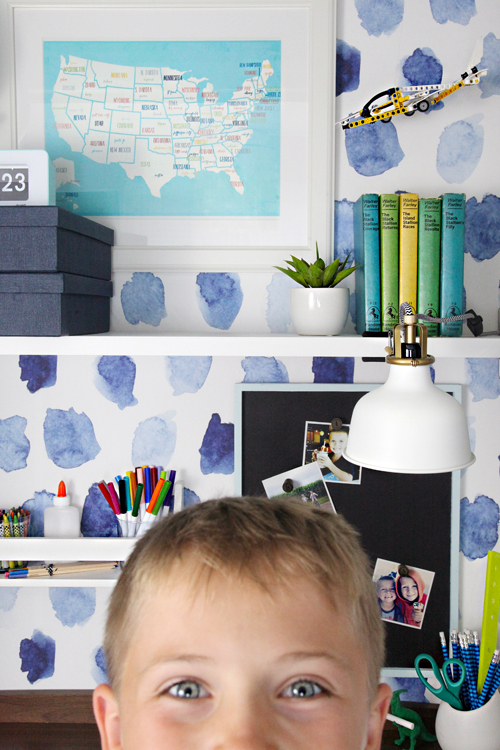 Parker really joined forces with me on this project; he helped select everything from the desk to the wallpaper to the map and globe. It is definitely a space that we are both very proud of, and I really appreciate that it is also cool enough for him to use for many years to come. I just hope he makes his way back out to the living areas to visit with us once in awhile. 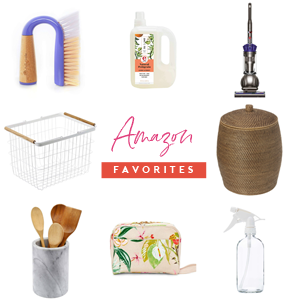 A huge thanks to Wayfair for providing some of these products to kick start the transition of our son to his new room and setting him up for school year success! And virtual hugs to the folks at Walls Need Love for providing the coolest temporary wallpaper pattern I have yet to find. 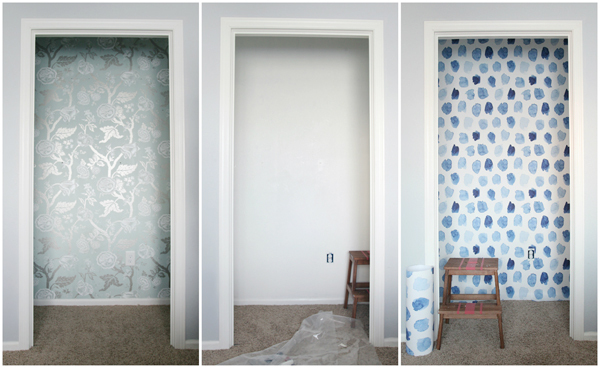 We absolutely can't wait to add the paper to the opposite side and get the rest of the closet installed. 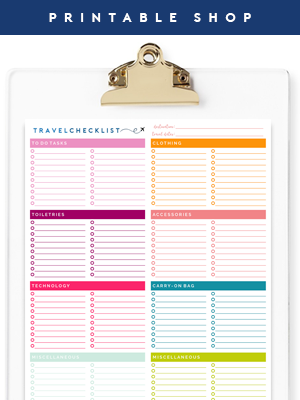 Are y'all ready for back-to-school season? 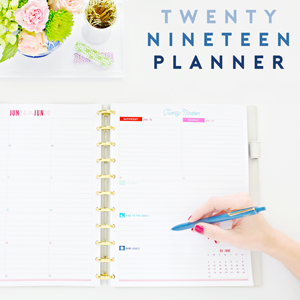 How do you prep for the big transition? Great space Jen! My favorite part is the big smile on Parker's face and that he jumped right in to work on a project. Great inspiration as I brainstorm my own son's new desk area...little more subdued since he's a big high schooler now but still fun for mom. Such a cute space! Love that wallpaper. 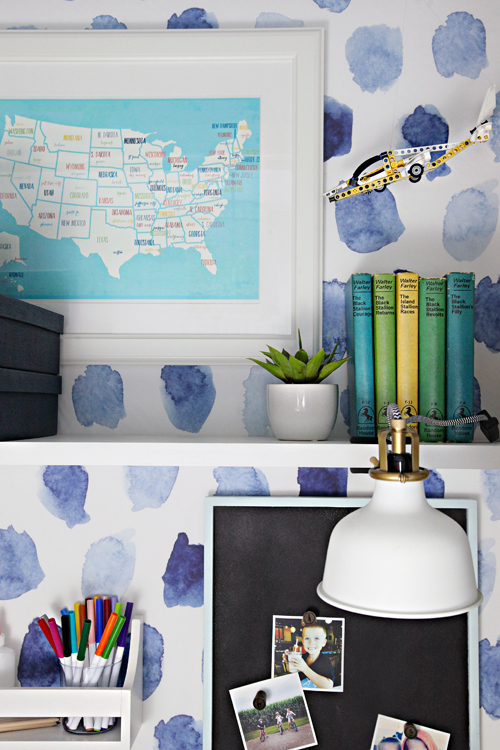 And the map print! I love the wallpaper!! We have some in our kitchen we want to take down but we have been debating on painting over it. Not really sure what we are going to do yet!! Love it! I was just searching Pinterest for "cloffice" ideas. What did you do for lighting in the closet? Did you already have wiring available? I love it!! I tried to access the 'art boxes' link under sources but was taken to the lamp instead. it looks great, but what about a daylight (window)? Will you really let him paint there?! It looks so cute & functional! 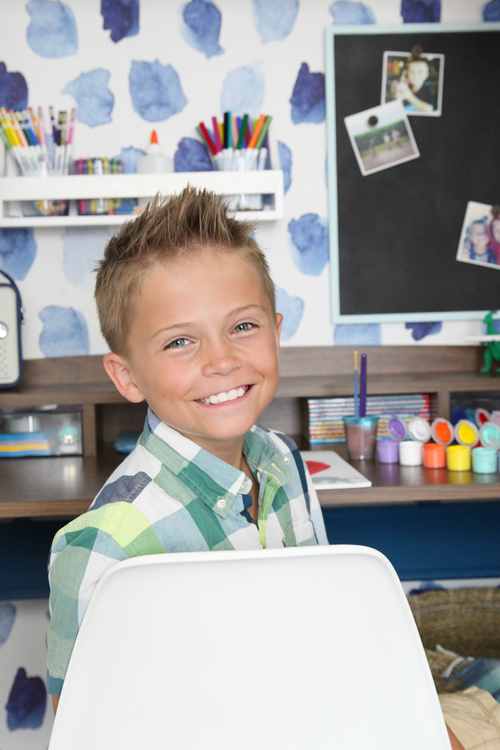 And Parker is adorable, love how excited he is about his new space! So good! Wow! I absolutely LOVE it! You've created such a happy space!! 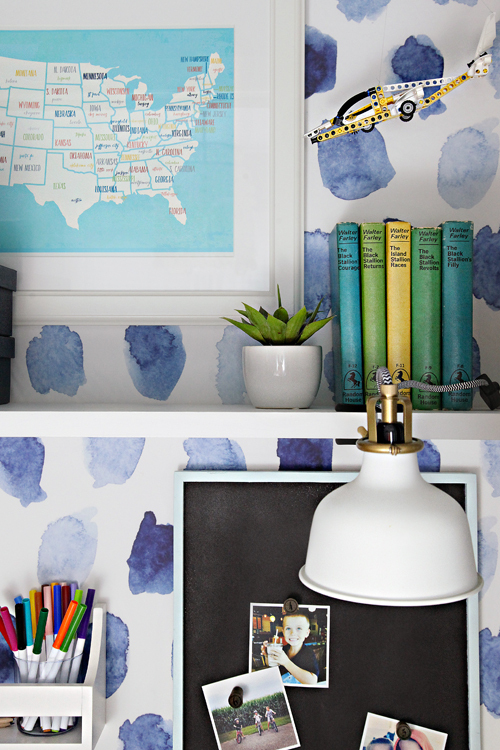 Love the wallpaper and open shelf! I'm interested in the brackets you used to mount the shelf. They're perfect. Would these work on a floating shelf this size? If so, can I get them from Lowes or online? I'm planning a computer space and you've given me some great ideas! Thx!! We found the stair tread was a nice solid wood that shouldn't bow or warp over time, given the length of the shelf and the types of items that may be stored on it. Thanks so much!! I just checked out the brackets from IKEA and they are very reasonably priced. I also have some stair tread's from a recent remodel that we just did so I think I might give it a try. So excited!